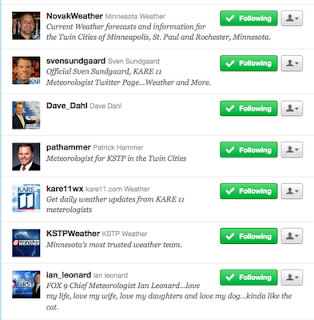 The Minnesota Forecaster: Twitter and Twin Cities Forecasters: Who Should You Follow? 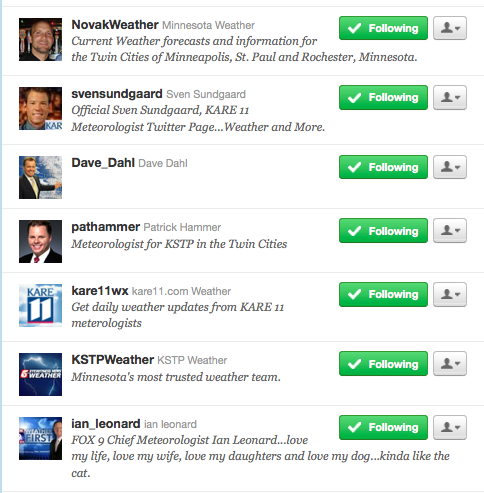 Twitter and Twin Cities Forecasters: Who Should You Follow? As social media, and in particular Twitter, become more and more the standard for the dissemination of weather information, we thought we’d devote a post to the tweeting activities of Twin Cities weather outlets and forecasters. We’ll include our philosophy on weather tweeting as well as an outlet-by-outlet assessment of the weathercasters with Twitter accounts. As it stands now, there’s a fair amount of inconsistency in the world of weather tweeting. For example, when breaking weather events develop, one can’t be sure whether it’s better to follow the generic station weather Twitter account (i.e., @WCCOWeather) or whether it’s preferable to follow one’s favorite weathercaster to receive updates. The generic Twitter weather accounts primarily just provide a single morning tweet on the day’s forecast; they’re essentially useless as a source for breaking weather. However, relying on a particular forecaster to provide timely tweets can be hit and miss, depending on whether the meteorologist is working at that time of day or is otherwise moved to tweet. We think weather outlets (primarily the television entities) would be well served to dedicate a single Twitter account whose sole purpose would be to provide breaking weather information. Twitter account names could be clear for this purpose, something along the lines of Fox9BreakingWx or KSTPBreakingWx. We understand that the “social” in “social media” suggests a type of communication that’s informal, friendly and almost fun, but when it comes to weather information, we think the tweets should stick to weather. It’s our feeling that weathercasters are first and foremost providers of weather, and not celebrities whose vacations and daily doings we need to know about. Yes, we’re old school. Just as importantly, too many nonweather-related tweets add up to wasted time, a commodity we all find to be in such short supply. Reading about the extreme garage sale, the trip to Israel, or one’s idle thoughts on Idol mean junk mail in the Twitter mailbox of a weather enthusiast. Not surprisingly, it appears that television weathercasters are more apt to delve into the “social” side of things than authors of weather blogs whose tweets are almost exclusively weather related. For weathercasters interested in sharing their personality, we suggest the use of separate Twitter accounts for weather information and celebrity doings. The following is a listing of the weather tweeters of the Twin Cities. Our list may not be complete; please let us know if there are others we may be missing. And, as always, we’d love to hear your opinion. @MorningWXGuy (Mike Augustyniak). Prolific tweeter. Unfortunately, roughly half of those tweets are not weather related. If you’re looking to follow him for weather information, you’ll have to sift through a lot of extraneous stuff. @WCCOShaffer. A basic, middle-of-the-road weather tweeter who seems responsive to followers’ questions and comments. @WCCOWeather. Daily weather tweets that provide links to daily WCCO weather blogs or the weather page. Good, standard fare. @Dave_Dahl. Given the sporadic rate of his tweets, you get the impression that KSTP is encouraging him to tweet, but he’s just not quite into it. @PatHammer. Frequent tweeter of mostly weather information. Consistently provides weather expectations for Twins games. @ChikageWindler. Yes, she’s in Indy now, but still a timely source for breaking Minnesota weather. Very social tweeter. @KenBarlowWx. Past record (from previous job in California) suggests a regular, primarily weather-oriented tweeter. We anticipate an initial period of sentimental “it’s nice to be back in MN” tweets, but hopefully weather discussion will quickly prevail. @KSTPWeather. Generally your basic straight “today’s weather” daily tweet. However, there are times when it’s used to retweet tweets from other KSTP staff, which feels overly promotional to us. @Fox9MJurica. Marina Jurica. Average tweeter. Generally sticks to weather only. @Ian_Leonard. A rather prolific tweeter with particularly frequent updates during severe weather. Sometimes on the edge of too many tweets that aren’t weather related. @KeithMarler. For the most part, tweets are dutiful morning weather updates. Non-weather tweets are existent, but minimal. @fox9weather. Inactive since March 28. Why? @JonathanYuhas. Prolific tweeter. All are weather related with some relating to interesting weather beyond Minnesota. Good stuff. @SvenSundgaard. Frequent tweeter with tweets both social and weather related. Tweets are a bit more personal/social/agenda-related than we’d like to see. @kare11wx. The daily – weekdays only – source of singular “today’s weather” updates. Why is this account inactive on weekends when weather is arguably more important than weekdays? @jerridsebesta. A fairly prolific tweeter, but too many tweets that have nothing to do with weather for our taste. @MPRWeather. Another excellent employer of Twitter. Tweets are exclusively weather related and come with appropriate frequency. A solid source of weather information for both the Twin Cities and greater Minnesota.